Blogging has been less frequent cos I have been mega busy- yippee! “Street Athletics is a series of community focused events throughout the UK where all youngsters are invited to race against each other over 60m, giving them the chance to compete in the Grand Final in Manchester and win a year’s kit contract with Reebok. 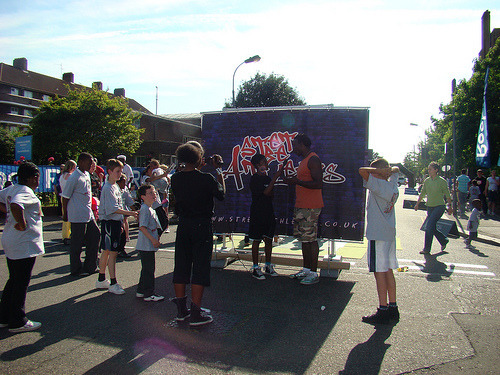 Nuff Respect are working with Positive Futures, Reebok, Sport England, Sony, Gaz de France and local councils to run Street Athletics events in various areas of the UK. I had a wicked time bonding and watching confidence levels grow as the young people involved got into the swing of blogging, vodcasting and using all the equipment. I then went to Hammersmith and Fulham and supported 2 digital journalists as they documented the event. You can read their blog post here. It was staged in the area where Linford Christie grew up, right next to his old primary school. Other exciting news: I will be going to Paris with one of our digital journalists to document the 2007 winners’ trip to the Grand Prix de Paris Athletics event this month. Yay!